Introducing the The Kanger EVOD BCC Bottom Coil Clearomizer. 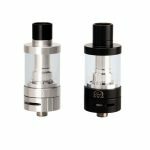 This atomizer features a slotted metal sleeve with a clear acrylic domed mouthpiece. The tip is not replaceable and is permanent. This tank features a filling capacity from 1.5ml to 1.8ml depending on how bold you are when filling. 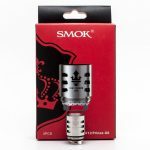 This unit comes from the factory with a 1.8ohm coil head. We offer 2.4ohm replacement atomizer coils if you like higher resistance. This clearomizer will fit well with our eGo T, eGo C, and eGo C Twist batteries/kits. It will also fit any device with ego threads. It has a thin base diameter that allows it to fit in the tight tolerances of some MODS. With the metal covering and the BCC coil this clearomizer is my favorite tank to go with the thinner batteries and for the price you can’t beat it.